Cry3Aa with RBS, TEV-site, and His-tag. araC/pBAD in front of it. This BioBrick enables expression of the Cry toxin Cry3Aa1. Expression is inducible by addition of arabinose. After the Cry3Aa coding sequence, a TEV-site and a His-tag are added, enabling His-purification and then cutting off the His-tag to prevent interaction with the desired Cry3Aa protein. Figure 1: Schematic overview of elements contained in this BioBrick. To prove the Cry3Aa toxin can be expressed using E. coli BL21 with induction of 1 % arabinose, cells were grown and both soluble and insoluble proteins were run on an SDS-PAGE. A band with the corresponding size can be found in the pellet proteins. Figure 2: SDS-PAGE gel. M represents the marker lane. In lane 1 and 2 is the supernatant of the protein extract is visible and lane 3 and 4 represent the pellet. Lane 2 and 4 are the negative controls, whereas the protein extracts from lane 1 and 3 originate from transformant. The expected size of the Cry3Aa_TEV_HIs protein is 76 kDa. Cry3Aa is known to be toxic to Tenebrio molitor. Therefore, we tested the toxicity of the toxin expressed with E. coli BL21 with an in vitro toxicity assay. 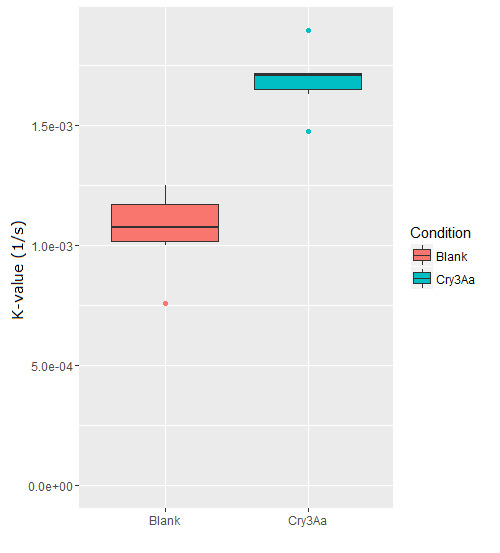 Figure 3: This boxplot shows the toxicity towards T, molitor of samples containing the expressed Cry3Aa protein compared to a negative control.